Although many people probably welcome the end of the Presidential election hoopla, some individuals, including myself, must cope with the abrupt cessation of political discourse. Reading All The Presidents Gardens (Timber Press, 2016) by Marta McDowell can ease the transition. From George Washington to Barack Obama, McDowell relates the development of the landscape surrounding the White House. 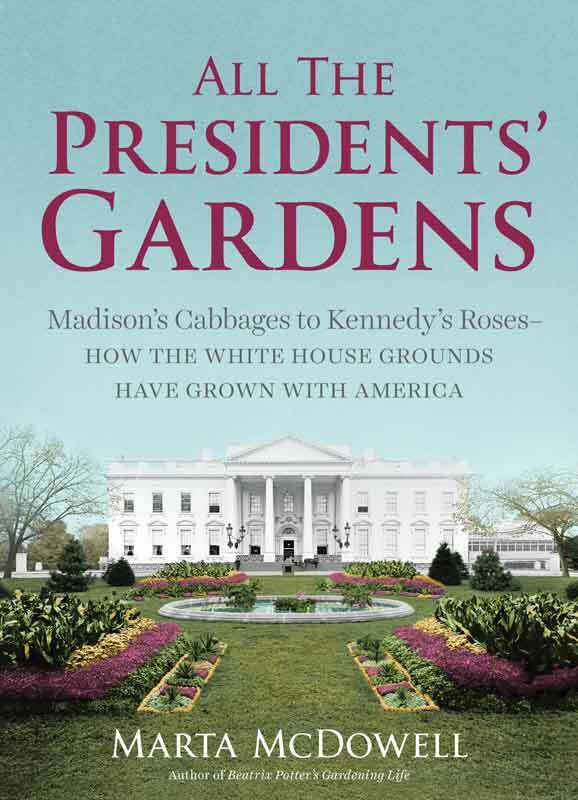 She reveals not only the various American landscaping trends that influenced the presidential gardens, but also the personalities of the first families instituting the changes. The location of the capital in Washington, D.C., was wrested away from Philadelphia by a political deal between Hamilton, Madison and Jefferson. Thus, the 18 acres surrounding the present White House started out in a swampy area 17 miles from Washington’s home in Mount Vernon. Thomas Jefferson was the first resident of the White House who lived in Washington long enough to impact its appearance. Limited by the American distrust of settings that were too palatial, Jefferson is credited primarily with dividing the lawn into the private and public areas that remain today. In 1809 James Madison purchased the first plants for a White House garden, American native trees, to follow a plan designed by Jefferson. The resulting garden was similar to those surrounding the grand plantation homes in which the majority of the early presidents lived. Madison’s garden and much of the White House were destroyed during the War of 1812. Many of the later presidents and their first ladies restored the garden space and added their own designs. Andrew Jackson installed the first greenhouse, which he called an “orangery.” Buchanan enlarged this small addition into a conservatory filled with exotic plants. Henry Pfister, the head gardener from 1877 to 1902, cared for the conservatory and added many greenhouses to propagate and protect tropical flora. These glass buildings were removed by Theodore Roosevelt to build what has become known as the West Wing. Other presidential influences remain intact. Washington’s cherry trees were introduced by Helen Taft. The Kennedys created the famous Rose Garden. Lady Bird Johnson’s beautification programs spread across America. The rose was declared the county’s floral emblem by Ronald Reagan. Michelle Obama and Eleanor Roosevelt each planted vegetable gardens on the White House lawn.